"Waiting" is an installation consisting of a video of a hand agitating a cloud, which plays on a small monitor at one end of a long, narrow room. On the opposing end of the room, a profusion of spoons cantilever out from the wall. Each spoon contains a small pile of dirt. Spanning the room between the two walls there is a four-inch deep slab of hard cracked earth. 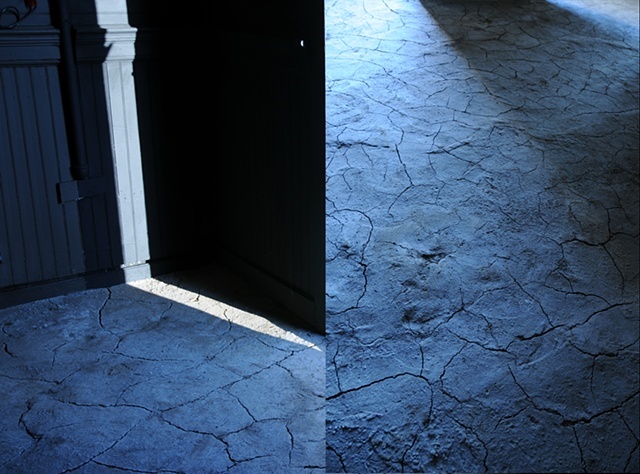 As viewers travel throughout the installation, they are able to walk on top of the cracked earth surface. This vast floor of cracked earth forms a landscape emphasizing both the tension and the potential between the provocation of the cloud and the longing of the spoons.